Preserving fruits and vegetables is a rewarding experience however sometimes things do go wrong along the way. We have put together a list of the most common problems that are encountered during preserving and how to solve them. Problems with setting are the most common problem when it comes to preserve making. A poor set can occur for a number of reasons; too much or too little sugar was used, an insufficient amount of pectin may have been used, the fruit used was either over ripe or under ripe or you may have cooked your mixture for too long. Don’t worry though as it is still possible to rectify the problem just follow the simple steps below. - Before you start you need to have a selection of sterilized jars available for re-potting your jam once you have finished. 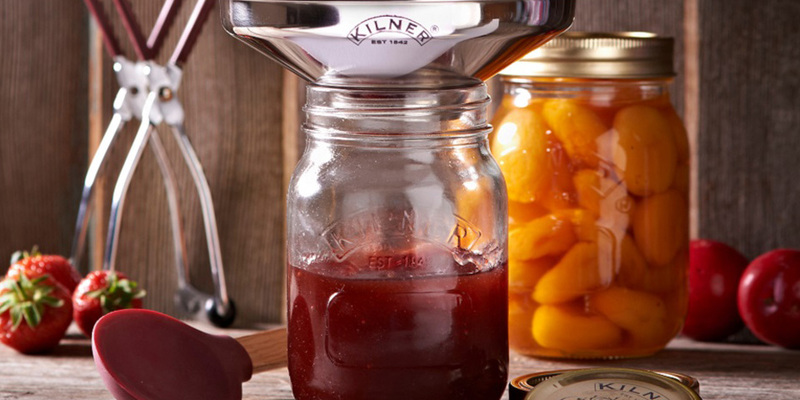 - Now empty the runny preserve back into your Kilner® preserving pan and try re-heating it. Bring it to a boil whilst stirring constantly to stop it from sticking, allow it to boil for 1 minute then re-test the set. If the set is now correct then re-pot and seal your jars. - If the set is still runny then try adding pectin. You will need approximately half the amount of pectin that is indicated by your recipe. Please be careful when adding pectin as too much will leave you with a set that is too solid and it is not possible to rectify this so always add less than you think is necessary and test the set and then add more if required. We recommend commercial pectin in either liquid or powder form for this process. The set of your jam should be correct now so re-pot and seal. Unfortunately it is not possible to rectify this after the preserve has been potted and sealed but for future batches we advise you to let your preserve rest for 10 minutes once setting point has been reached. This will allow you to see if the fruit rises to the top, if it does stir the preserve to redistribute the fruit and then pot immediately. This will happen if your preserve has stuck to the bottom of the pan and burnt during boiling. To avoid this for the future stir your preserve constantly whilst bringing it to a rolling boil. If the color of your preserve gets darker once it is stored this may be as a result of cooking the mixture for too long. Make sure to follow the recipes times exactly. This change in color may also occur if the place you have stored your preserve is very bright or if it is very warm. It is important to store your preserve in a dark and cool location. Your jelly can turn cloudy for a number of reasons; you may have used under-ripe fruit which has released starch which has turned the mixture cloudy. It is important to always use ripe fruit. Another reason for cloudy jelly is you may have squeezed the jelly bag or muslin cloth whilst your jelly was straining through it. You must leave your jelly to strain through untouched. Jelly can also turn cloudy if it is allowed to cool before potting; jelly must be potted immediately after setting point has been reached. Although this is not desirable your preserve is still perfectly edible. Crystals can form in your preserve because the sugar used has not been completely dissolved before boiling your mixture or because too much sugar has been added. The next time you preserve be sure to use the correct amount of sugar and dissolve it thoroughly before boiling. Fermentation has occurred if small bubbles start to appear in your jam whilst it is being stored. If this happens it means that yeast is present and it has started to react with the sugar. This problem has nothing to do with the ingredients used. It is a hygiene problem. Next time you preserve take extra care when sterilising your jars and make sure a good airtight seal has formed after processing. If mould appears in your preserve whilst being stored you must discard it immediately as it is not edible. The next time you preserve be sure to take extra care during sterilisation of jars and lids or seals and make sure a good airtight seal has formed. When you store your preserves make sure to store them in a cool, dark and dry place. Warm and damp stores can encourage the growth of mould.